The objective of the project “MoPaDual – Modelo paraguayo de Formación Dual” is to establish dual vocational education and training in Paraguay. At the request of the country’s government, BIBB is advising the Paraguayan Ministry of Labour on the establishment of institutional foundations and on the development of VET standards. This article describes the initial results to emerge from the cooperation, taking the development of occupational profiles and curricula as an example. Paraguay is on the up. Gross Domestic Product has risen by an average of 4.9 per cent over the past few years (2003–2013), whilst the poverty rate has fallen from 44 per cent to 22 per cent over the same period (cf. ILO/Cinterfor 2017, pp. 171 ff.). Flows of investment, urban growth and technological changes all require new and adapted occupational competencies. Within this context, initial and continuing VET has an important part to play in the future competitiveness and sustainability of the Paraguayan economy. The current demand for high-level skilled work is the result of progressive investment support to strengthen competitiveness. It is also the expression of active labour promotion. Over half (56.3 per cent) of the population of Paraguay is aged under 30. Youth unemployment is more than twelve per cent (cf. ILO/Cinterfor 2017, pp. 171 ff.). 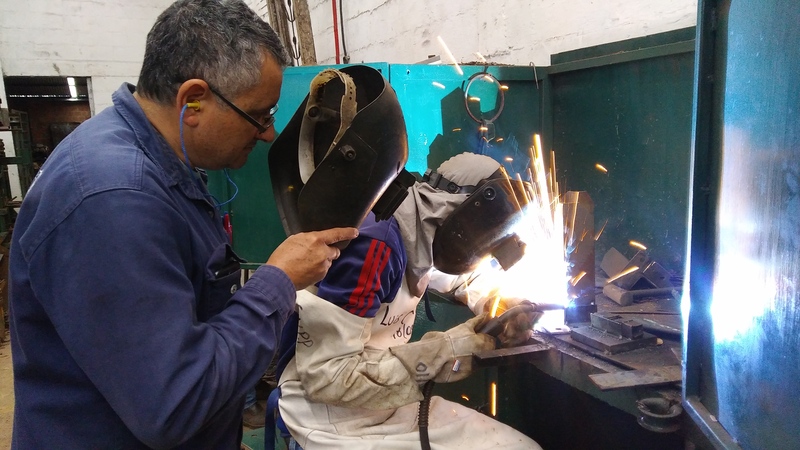 Paraguayan companies bemoan the fact that workers are not trained in a practice-oriented way. VET in the country has previously offered trainees very little in the way of practical experience at companies. The Paraguayan Government believes that one way of facing up to these challenges is to involve companies in VET and to strengthen cooperation between the state and trade and industry in the planning, implementation, monitoring and financing of VET. In 2016, the Ministry of Education and the Ministry of Labour requested BIBB to work with stakeholders in the country on the development of a dual training model that would take existing general conditions as its starting point and would accord due consideration to Paraguayan needs. The aim was to focus on three core elements of dual VET. The implementation agencies are the National System for Initial and Continuing Training (SINAFOCAL) and the National Service for the Promotion of Professional Education (SNPP), which offers initial and continuing training courses right across the country. Both institutions are governed by the Ministry of Labour. A MoPaDual Project Office was established within the SNPP and assigned the task of working under the supervision of SINAFOCAL to provide technical and organisational coordination for the project and the participating stakeholders. An expert from the Centre for International Migration and Development (CIM) 1 has been deployed at MoPaDual since mid-2017 to support the work being carried out. The initial stages of cooperation comprised an analysis of prevailing general conditions and of the institutional structures and elements of training practice in Paraguay. Needs assessments in three sectors were then used as a basis for the identification of occupational profiles in three sectors, and work began on developing practice-oriented training curricula. Measures for the training of training staff and instruments for cooperation between learning venues were also drawn up. This article concentrates on presenting the approach adopted for the development and implementation of the occupational profiles. Education in Paraguay starts with early years support in nursery school and pre-school provision for children aged between 0 and 5. This is followed by nine years of free and compulsory primary education. School attendance is mandatory until the end of Year 9. Upon completion of primary schooling, young people may enter work, progress to the secondary training sector or commence intermediate level VET (cf. Figure). and Science (Ministerio de Educación y Ciencias, MEC). This responsibility includes the contents of technical secondary education and of intermediate level VET. Non-formal VET is the responsibility of the Ministry of Labour, Employment and Social Security (Ministerio de Trabajo, Empleo y Seguridad Social, MTESS). VET is essentially financed by employer contributions (1% of payroll). Since 2014, both ministries have been working together to develop a National Catalogue of Occupational Profiles designed to help structure and synchronise the various courses offered by the ministries themselves and by further public and private sector institutions. The intention behind the National Catalogue is to draw up occupational families containing occupational profiles at a total of five levels in 23 economic sectors. The MoPaDual project used existing needs assessments in the metal working, electrical and road construction sectors as a basis for working in conjunction with trade and industry to identify and map out occupational profiles. Whereas a comprehensive sector study had already been carried out in the metal working sector in 2016, the work conducted in the area of road construction was aligned to the nascent National Catalogue of Occupational Profiles. Because profiles for the construction/road construction sector have only previously been elaborated at level 3 (technician), agreement was reached with the relevant employer association and with selected companies to commence development of an occupational profile for skilled road builder at level 2.2 However, work on this profile subsequently needed to be postponed because no experienced specialist staff could be acquired. In the metal working and electrical sectors, several workshops were held from September 2017 onwards, in which companies, training staff and teachers cooperated with further specialists from the organisations involved to develop two training profiles. Core representatives from six companies in the metal working sector are participating in the process. The working group for the electrical sector includes delegates from only two major firms, one of which is the state-owned power supply company. Company representatives comprise function holders exercising executive management tasks and company-based trainers. As well as participating in this ongoing work, the latter have also been attending a trainer programme run by SNPP, which has been developed and implemented with support from the CIM expert on the ground. The trainer programme, which has a modular structure and extends over a total period of 160 hours, offers didactic and pedagogical contents and a block providing an introduction to the dual system of VET. 37 company-based trainers and other teaching staff have successfully completed this continuing training scheme thus far. These tutores de empresa fulfil an important multiplier function and are able to bring their expertise to bear both in the structuring of cooperation between learning venues and in the curriculum workshops. They are therefore highly significant in terms of commitment within the MoPaDual project and with regard to the success of the programme. Although company-based training is nothing new for companies, it largely takes place in an unregulated way. This means that there are no curricular stipulations, and such training consists of internships or induction phases. The starting situation of the MoPaDual constitutes a major challenge for all parties involved. The topic of VET has been ascribed very little importance by employer associations, chambers and trade unions in the past. For the companies, sharing responsibility in this way and using their own specialist expertise to help shape the development of occupational training standards represent a completely new role. There is virtually no awareness of the notion of VET as a concept which links an overarching and broad approach with specialist training to produce skilled workers capable of flexible deployment and able react to changing requirements. Employment-oriented training aligned to self-contained work and business processes which places the main focus on individuals acting autonomously, while combining practical abilities and specialist knowledge with cross-cutting competencies such as team and communication skills, is unchartered territory. This applies both to the companies and to SNPP in its capacity as a school provider which delivers courses founded on systematic theoretical and cognitive structures. Can implementation succeed against such a background? On the basis of evaluations and a meta evaluation of projects relating to VET cooperation, STOCKMANN/SILVESTRINI (2012) arrive at a critical appraisal of the sustainability and broad effect of VET collaboration projects. Alongside flexible project management and good general conditions, the “indispensable core elements” of successful projects have in particular been “ownership and qualified and committed staff” (ibid,. p. 11). Even the transfer and adaptation of individual elements of the dual training system requires time as well as ownership and the necessary resources because “concepts and strategies for transfer are only (able to be) developed within the scope of the specific social, cultural and economic conditions” (EULER 2013, p. 16). Ownership and acceptance of objectives are present in the MoPaDual project both at the policy and strategic and implementation level and especially amongst the companies and training staff taking part. By way of contrast, time and resources are critical factors. Processes for curriculum development, for the establishment of suitable general legal conditions and for the creation of examination structures are all protracted. The sustainability of the project will be in jeopardy if structures and resources which will be able to support and secure the further process beyond the project term are not successfully instigated. One positive aspect is that the project enjoys a high degree of priority from policy decision makers. The starting situation, which has only been briefly outlined here, corresponds with the experiences so far gleaned from the development of curricula. There are separate work groups for the metal working and electrical sectors, although a joint approach is also adopted in the case of cross-cutting topics. The German training occupations of industrial mechanic and electronics technician for industrial engineering served as a reference in the case of the profiles for the two-year training programmes in the occupation of industrial mechanic and industrial electrician, and the former were presented and discussed in the workshops. The metal working group initially arrived at a plan for the first year of training, and this has now been supplemented by a draft proposal for the second year. The working group for the electrical sector has thus far completed a rudimentary plan for the first year. These plans are aligned to a curricular stipulation produced by SNPP for school-based training, which was expanded into a “PlanDual” by adding a company component. The PlanDual uses a list of the essential contents of the occupational profile to formulate the joint requirements made of school-based training (30%) and of company-based training (70%). It includes learning objectives for both learning venues, didactic and methodological guidance, further specifications of tools and materials and information regarding evaluation. The content requirements for each element are preceded by the cross-cutting learning objectives which characterise the occupational profile. These learning objectives each map part of the vocational ability to act to be imparted, and the aim is that they should be described in an action-oriented and competence-oriented way. The realisation of this concept remains in its infancy. Both the further development and implementation of the plans, which have been pursued via a pilot phase since March 2018, are a major challenge for all those involved. School-based contents have hitherto tended to feature a theoretical and cognitive structure and are taught in a sequential and modular way. Interdisciplinary project teaching is virtually non-existent. Companies also continue to align themselves very closely to this model. Initially, for example, they were completely oblivious to the fact that they are not required to implement the plan on a 1-to-1 basis and are permitted to deviate from the sequential and modular imparting of contents in order to develop cross-cutting work and learning tasks which are a better match for their actual requirements and processes. Considerable action is needed in this area in order to raise awareness of the topic of action and competence orientation amongst company-based trainers and on the part of specialist MoPaDual staff in particular. The curricular design work carried out shows that a number of specific company requirements cannot be brought together under a uniform profile (for example the field of foundry technology in the case of the metal working profile and the areas of high voltage engineering and refrigeration and air conditioning technology in the electrical profile). The introduction of differentiations in the second year is being considered. As developments continue, it may also be necessary for divergent requirements to be covered by new separate occupational profiles. With regard to implementation in the companies, all participants have thus far displayed a high degree of commitment and a strong readiness to invest time and manpower in training. However, there is a variance in the way in which trainees are integrated into company practice. The spectrum here is extremely wide. There are examples where practical relevance at the beginning of training is low due to a preponderance of theory-led introductory courses, but there are also instances of very good work and project scenarios which involve trainees from the outset. Company visits have shown that feedback from trainees is certainly positive. The directly practical part of the training is especially appreciated. Training is managed via company training plans and by a report portfolio which provides documentation. Networking between participating companies and monthly meetings of company-based trainers and SNPP teaching staff also take place within the scope of the cooperation between learning venues. 1 The Centre for International Migration and Development (CIM) is a working group set up by the Deutsche Gesellschaft für internationale Zusammenarbeit [German Agency for International Cooperation] and the Bundesagentur für Arbeit [Federal Employment Agency]. Its role is to identify experts who are then posted abroad. 2 In Paraguay’s 5-stage qualification framework, level 2 is approximately comparable to skilled worker training at levels 3 and 4 of the German Qualifications Framework.